There are several strong trends running through specialty coffee industry. First and foremost is the continual upgrade by cafe owners in terms of coffee quality, choice of equipment and acknowledgement of THE IMPORTANCE OF EMPLOYING SKILLED BARISTAS. The specialty coffee cafe is often characterised by the local design aesthetic (a mix of industrial, retro and recyclable/sustainable design elements). La Marzocco, Synesso, Slayer or similar coffee machines, baristas who know what they are doing and who do it with care and attention, and finally of course, specialty coffee. Cafe owners are much more likely now to own their own equipment which makes contracts with their coffee suppliers less relevant. (It was a common industry business model for roasters to offer "free-on-loan" equipment in return for fixed term contracts for supply). The key to long-standing relationships between cafe owner and coffee roaster is now the quality of the coffee and the service they provide in terms of equipment repair and training of staff. Offering more than one type of coffee is expected in top cafes, with multiple grinders offering single origins as well as blends. Seeing cafes offering coffee by different coffee roasters simultaneously is something that is also becoming a little more common. Which brings us to alternative brew methods to espresso. Espresso is still king, but slowly we are seeing the more gentle brewing methods creep into consumers' scope, with a common order including both an espresso coffee and a filter. This new appreciation for filter coffees has been largely driven by professional baristas. Branding is definitely becoming less prominent, and indeed in specialty coffee cafes is pretty much non-existent. Consumers are not as naive when it comes to brand promises, and cafe owners are becoming more concerned with promoting their own brand rather than their suppliers! Specialty cafes do not use branded wind-breaks, umbrellas, soft drink or milk fridges. The brand promise is laid at the feet of the cafe itself and this is a big change in the industry. Fortunately for specialty coffee, the focus on quality is a win-win for both roasters and cafe owners. Quality coffee is recognised as a key sales driver, providing a strong platform for food sales and encouraging multiple visits during the day. The barista role is now firmly entrenched as a crucial part of a successful coffee business. Gone are the days of just anyone jumping on the machine and pumping out a few coffees here and there. With this new respect for the position has come a new level of professionalism, and a good barista is now financially rewarded. Baristas now understand their product far more than ever before. Where once it was good enough to know how to froth milk correctly, today's barista needs to understand the behaviour of their coffee during service and change the grind, the shot times, the load in the handle, accordingly. They understand the ageing process, different roast profiles, different origins and what they mean in blends. In fact, the top baristas are up there with the roasters in their coffee knowledge, challenging them to produce a consistent quality product. 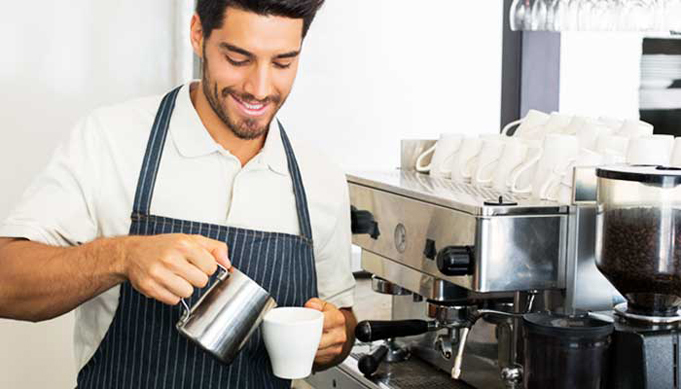 Career paths for the professional barista have exploded in the last couple of years, with job options moving a great deal from the traditional aspiration of becoming a cafe owner or manager. Today we see professionals move into training careers at coffee roasters, chain stores, caterers and other food service businesses. We see many move into the roasting side of the business. And now with the huge growth in local roasters, we see new roles being created, including sales and account management, quality control, cupping, green bean purchasing and more. As the industry grows, so do the opportunities; there has never been a better time to become a barista.